As I prepare myself for this weekends World of Pinot Noir event, Santa Barbara’s annual wine tasting seminar and weekend-long seaside celebration, I am playing around with different variations of chocolate truffles to make for the VIP Lounge. Coming to the conclusion, all you really need is good quality dark chocolate, red wine, cream, and a bit of butter. That’s it! Melt it all together, let your ganache sit overnight, then roll into truffles and dust with cacao. This may go without saying but it bears repeating: my thought when pairing wine with chocolate, is that the chocolate should be of the highest quality. Whether the chocolate is white, milk, or dark, its origins should be impeccable. As with food, the general rule when making these, the darker the chocolate, the darker the wine. So, reds are ideal for dark chocolate truffles. These decadent wine truffles are infused with red wine but don’t feel constrained. Go ahead and experiment with making milk or white chocolate truffles with white wines and champagne. Coarsely chop the chocolate and place into a medium-sized bowl. Bring the cream to a simmer, add the butter and stir until melted. Pour the warm cream over the chocolate and stir until the chocolate is melted. Add a big pinch of salt and the red wine and stir until the wine is incorporated. Pour into an 8×8-inch baking dish and refrigerate for at least 4 hours. Scoop to form each truffle into even portions, coat your hands in cacao and gently roll the chocolate until it forms a uniform ball. Roll in cacao to coat. Keep the truffles refrigerated and take them out about 30 minutes before serving. I suggest making these at least a day before eating, to allow the wine flavor to intensify. Keep for up to a week, if they last that long! General guidelines – Dark chocolate (60% to 75% cacao content) pairs well with more robust wines, such as Cabernet Sauvignon, Zinfandel, Pinot Noir, and Port. 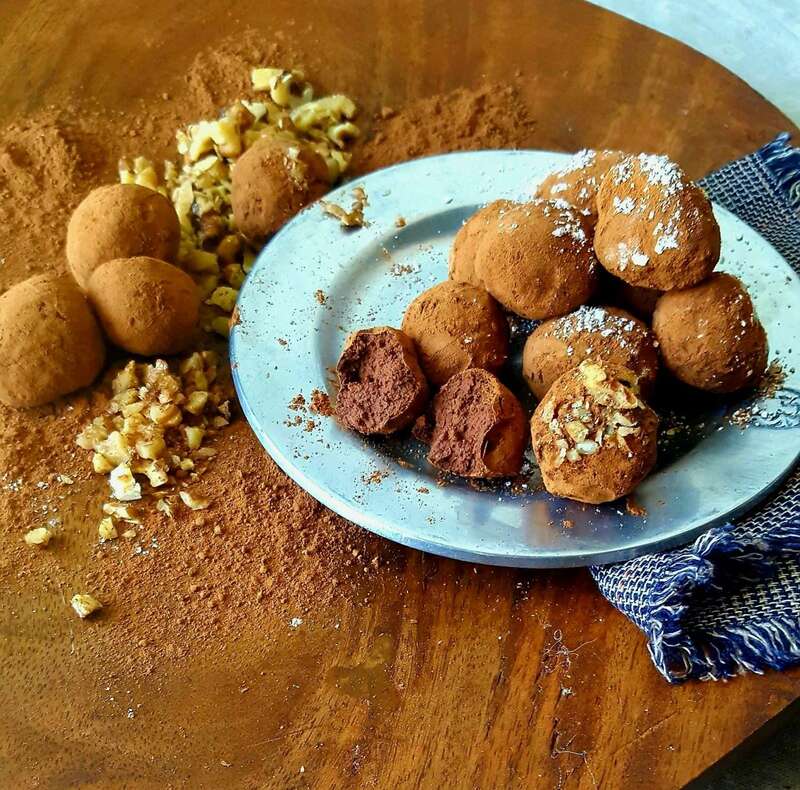 A Chianti can be lovely with chocolate around 65 percent cacao content, while sherry, a fruity Chardonnay, or a sparkling wine will enliven your white chocolate truffles as these wines will pick up on the buttery, fatty tones of the cocoa butter. Last but not least, milk chocolate marries well with a Merlot, Pinot Noir, Riesling, and sweeter dessert wines.